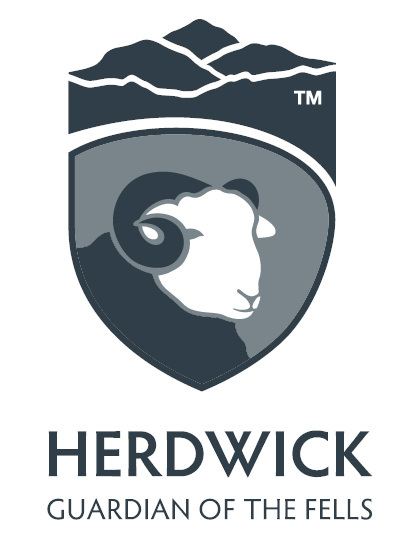 In the weekend courses you will be experiencing the fun of learning new skills using Herdwick wool from some of the oldest Herdwick flocks in the country. You will be able to watch those very sheep grazing on the fields as you work in the in the atmospheric Wild Wool Barn at the heart of Herdwick country. Susan will share her many years experience working and designing with Herdwick wool to begin your exploration into making your own beautiful, hand-made textiles. No prior experience working with wool, spinning or weaving is necessary. Refreshments and all materials are provided, but please bring your own lunch. 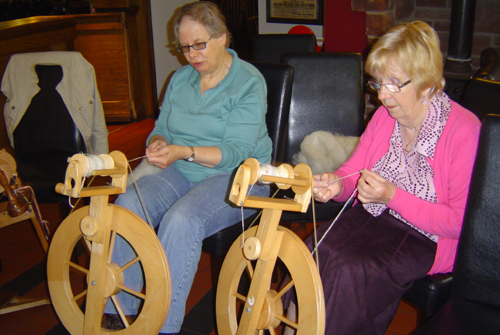 Using a traditional spinning wheel and Herdwick fleece you will learn how to create your own yarn for use in your own crafts. Starting with the raw fleece, you will find out how to prepare the fibres for spinning. You will learn how to wash and prepare the fleece using combs, and carders, of many shapes and sizes to create “rovings”, “rolags” and “slivers” to begin the spinning process. Once your fibre is prepared for spinning then the magic of spinning begins. You will learn how to control the spinning wheel with the treadles, whilst drafting the fibres to make a smooth yarn. You will understand how to change the tension, understand how twist affects the yarn, create singles and then ply your creations to make a balanced yarn. Herdwick and other fleece fibres will be used during this course. Create a Rug in a day. 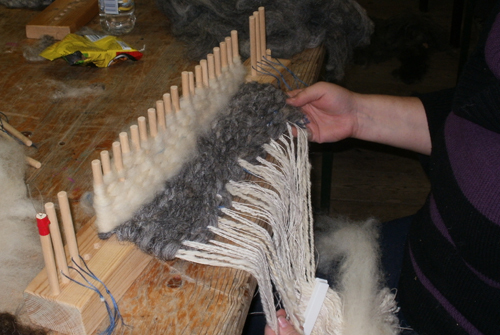 Starting with the raw fleece, you will begin the class by preparing the fibres for weaving. 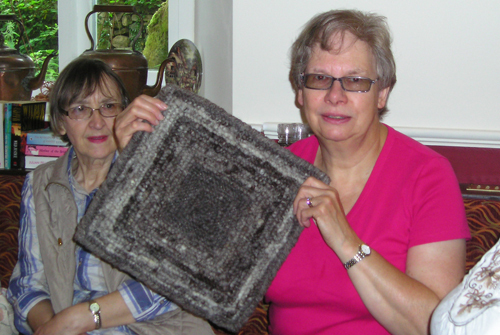 You will learn how to wash and straighten the fibres using a drum carder to create “Batts” and “Rovings” and blends for colour and fibre mixing. 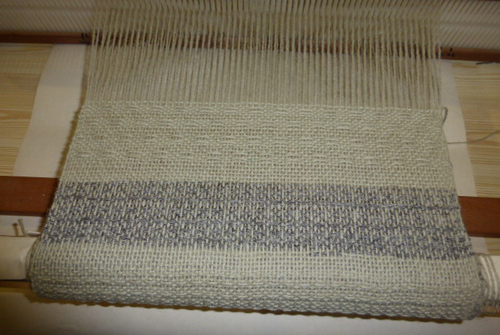 Next you will warp-up the peg-loom using a direct warp of linen, and then learning to weave begins. Drafting and handling the fibres spreads them out to make a soft but stable “weft”, which forms the surface of your rug. Peg looms, linen and wool. Herdwick and other fleeces are provided. Some peg-looms are available to buy. If you feel you may want to continue your project at home please indicate this at the time of booking so that a peg loom for purchase can be used to start your project. If you already have a loom feel free to bring it along. You will be learning the little known art of Locker Hooking to create a stunning place mat. The method is similar to that used to make traditional hooked rugs and but uses a specially designed crochet hook-style needle threaded with linen to fix the design in place. Originating in the UK as a rug method to reuse and recycle fabric scraps, the style you will be learning is called Australian locker hooking, which was developed in the 1970s using raw fleece on rug canvas. In this course you will learn the basics of locker hooking using Ennerdale Herdwick wool to create a beautiful, table mat. You will learn to card, and draft wool, hook the fibres into the canvass and finish the work. The locker hooking tool will be available to purchase (£5) if you wish to take one home. All materials for the mat are provided. Learn one of the most basic forms of weaving on a rigid heddle loom, but discover its versatility. You will start by learning to warp-up the loom (lambswool) by direct warp and with a warping board. Using the Herdwick wool from the local flocks you will learn plain weave, understanding how to create the correct "set", throwing the shuttle introducing colour. Then you will move on to exploring the many possibilities of weaving on a rigid heddle loom, introducing pattern with a floating weft using a pick up stick and exploring texture and colour pattern ideas. You can create a sample piece (or wall hanging) or plan to use your fabric for a cushion or table mats. For the majority of work you will use Herdwick wool. If this is not available Susan reserves the right to replace this with other fleece suitable for the project.